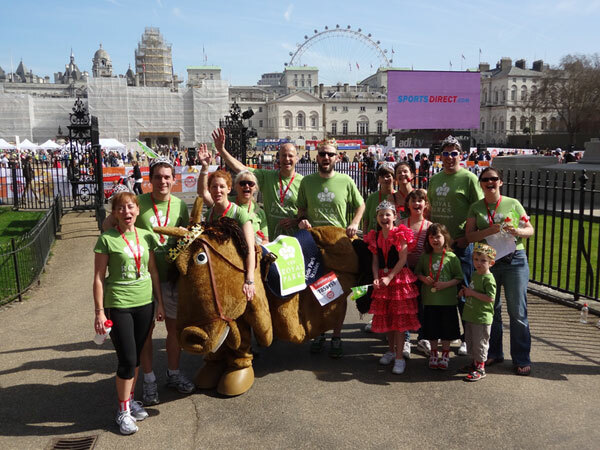 The Royal Parks played a huge part in the success of Sport Relief Mile on The Mall - hosting the event and entering a team of runners, lead by pantomime horse 'Rupert the red racer', who raised hundreds of pounds for the charity. Despite a very hot day, Marcus Coatsworth and Sarah Cook fearlessly donned furry friend 'Rupert the red racer' to trot down The Mall alongside ten other The Royal Parks colleagues and Londoners of all ages, who were eagerly cheered by the crowd. The team raised the £600 in donations via Just Giving and the money will help people in the UK and the world's poorest countries. On Sunday 25 March The Royal Parks hosted the event which had more than 20,000 runners and riders taking over some of London's favourite landmarks Horse Guards Parade, The Mall and St James's Park. Fitness instructors also featured on large screens on Horse Guards Parade to ensure all those taking part were limbered up and ready to race. "Although it was hot and uncomfortable in the costume the encouragement from the crowd and other runners meant we had all the motivation needed to make the finishing line. In fact there was no finer moment than trotting down The Mall with so many enthusiastic people raising money for a great cause." Almost 40 million Londoners and tourists visit the eight Royal Parks each year. The 5,000 acres of historic parkland provide unparalleled opportunities for enjoyment, exploration and healthy living in the heart of London. The Royal Parks will play a key role in Great Britainâs busy summer, hosting a number of Diamond Jubilee celebratory events as well as eleven London 2012 Olympic and Paralympic events. For media enquiries contact 0300 061 2128 or press@royalparks.gsi.gov.uk.